We are once again raising money this summer for a cause that is near and dear to our hearts. Camp4ever!, is an extraordinary overnight camp that gives children with a seriously ill mother or father a vacation from sickness. A summer in camp restores their spirits and renews their strength to persevere! We are very close to the start of camp and the program is totally maxed out. There is not even one seat available on the busses. We have many children who are on a waitlist, who critically need and deserve this chance to attend this life saving program. I cannot begin to tell you how many ill parents are calling and emailing us daily, imploring us to find a way to accommodate their children. The only thing holding these children back from attending Camp4ever is a lack of funding. It would take $300,000 in additional funding to accommodate these children. We know how vital this program is for these parents and children. It is heart-wrenching to know that we have the ability to help these children and all that is holding us back is funding. How can we choose between a child who refuses to go to school because his father was just given a terminal sentence and a teenager who has been running her house for the past few months as her mother undergoes chemotherapy treatments? 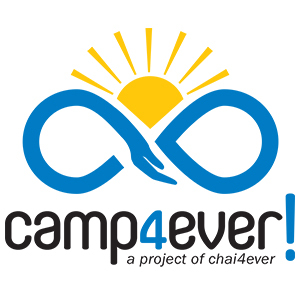 Working at Chai4ever allows us to see first-hand how transformative the Camp4ever! experience can be for a child. Their time in Camp4ever! gives them much needed strength and hope which keeps them going throughout the year. We now have a unique opportunity to DOUBLE the next $50,000 that is raised. A donor will match up to $50K of new donations, so your donation will be doubled!! Please take advantage of this opportunity to enable us to accept more children to camp who desperately need it! Thank you for supporting us and by doing so, helping children and their families cope with the diagnosis, treatment and aftermath of serious parental illness.